Did you know when the Eads Bridge was built it was as long as about 18 football fields and it paved the way for construction of the Brooklyn Bridge in New York City? Or that the new Mississippi River Bridge, the first bridge built connecting Missouri and Illinois in 40 years, will weigh 31 million pounds? 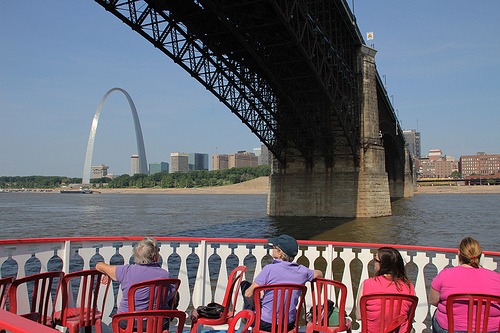 The oldest and newest bridges over the Mississippi River at St. Louis are the focus of a new riverboat cruise that launched Saturday, June 16 with boardings on the first and third Saturdays in July, August and September. A cruise has been added for October 6. Boarding begins at 8:30 a.m. at the Gateway Arch Riverboat dock located on Leonor K. Sullivan Boulevard. The ride up the river on the Tom Sawyer Riverboat features the Mississippi River Bridge, which is under construction. When that bridge opens in early 2014, it will connect Illinois and Missouri via a relocated Interstate 70. 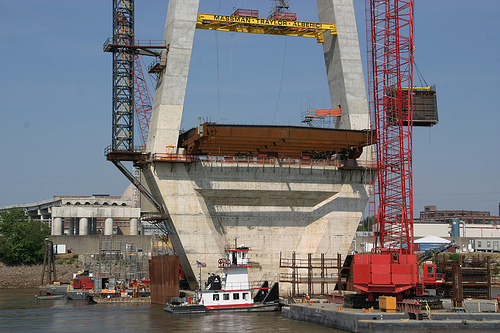 When completed, the Mississippi River Bridge will become the third longest cable-stayed bridge in the United States. The new $667 million dollar bridge being built over the Mississippi River has generated significant interest. The new St. Louis River Bridge Cruise will give bi-state area residents and out of town visitors a unique view from the Mississippi River of the bridge under construction as well as up close views of the 138-year-old Eads Bridge, which was the first bridge in the nation to be built primarily from steel. The design and construction of the Eads Bridge was highly controversial and some people feared it would collapse into the Mississippi River. To demonstrate it was safe, an elephant was paraded across the bridge and back. It was felt that elephants had a special instinct that would keep them from setting foot on unsafe structures. That is just one of the many things pieces of rich Eads Bridge history you will learn on the riverboat cruise. Last month, the Bi-State Development Agency/Metro kicked off a full-scale restoration of the truss and supporting superstructure of the Eads Bridge which is national landmark. The Eads Bridge rehabilitation project will be completed in 2015. The Agency owns the rail deck and superstructure of Eads Bridge while the City of St. Louis owns the vehicle deck. Bi-State Development Agency/Metro also owns and operates the Gateway Arch Riverboats. The special bridge tour cruises will be offered twice a month on Saturday mornings through September. An extra cruise has been added for October 6. The cruises are one hour with tickets priced at $14 per adult and $8 per child, with no charge for children 2 and under. For information or reservations, call 1-877-982-1410 or visit www.coreofdiscovery.com.